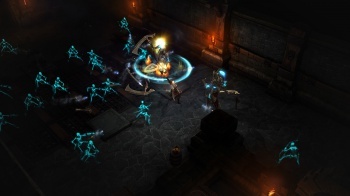 The Diablo III: Reaper of Souls "Friends and Family Beta" is now underway, and Blizzard says the closed beta will go live by the end of the year. The Diablo III expansion Reaper of Souls, unveiled to the world back in August, is now in the early stages of testing through the "Friends and Family Beta," which provides access to the game to friends and family of Blizzard employees. For the first time in such a test, Blizzard is also opening the gate to "valued media contacts and key members of the Blizzard community," as well as 3000 Diablo III players from around the world. Don't feel too badly about things if you're not taking part, as Blizzard said the conventional closed beta test will begin by the end of the year. Invitations to that stage of the beta, which like the Friends and Family beta will include all Reaper of Souls content but the final boss fight, will be "extremely limited," but additional players will be invited to join throughout the testing period "to ensure that all of our features like the Crusader, Mystic, and Adventure Mode get the testing they deserve." If you want in on the action, simply ensure that your Beta Profile Settings in your Battle.net account are set appropriately. Blizzard also announced that access to the Public Test Region for patch 2.0.1, which will include Paragon 2.0, Loot 2.0, the new difficulty system, addition of Clans and Communities and balance and tuning changes for all five character classes, will open at around the same time as the Reaper of Souls closed beta begins.